The common name for peanut oil, this is light-flavoured, inexpensive and produced all over the world. It has a relatively high saturated fat level, and is the best choice for stir-fries and deep-frying because of its high smoke point. Rich in monounsaturates and antioxidants, including vitamin E, this speciality oil helps to protect the heart and manage inflammation. Pioneered in Australia and New Zealand, and made from avocado flesh rather than stones, it has an attractive grassy colour and a slightly nutty flavour. Although expensive, it can be used for cooking and has a high smoke point. A classy touch drizzled over a mozzarella & tomato salad, or use as a base for salad dressings and marinades. Walnut oil, produced largely in France, Australia, New Zealand and the US, has a distinctive taste and provides mainly monounsaturated fat. The best versions have a rich, sweet flavour – use sparingly for drizzling and dressings. Once open, use within a month. Hazelnut oil is more delicate – it makes an exquisite salad dressing teamed with raspberry vinegar. Other nut oils, such as almond and macadamia, are also high in heart-friendly monounsaturated fats – but virtually tasteless. Oil from coconuts – not technically a nut – is solid at room temperature and is very high in saturated fat. It adds a distinctive flavour to bakes, and a rich finishing touch stirred into Asian dishes. Known in the US as canola oil, rapeseed oil is light-flavoured and all-purpose. A good source of both poly- and monounsaturated fat, it contains the lowest saturated fat of any of the oils on this page, with less than half the amount found in olive oil. It is a good source of omegas 3, 6 and 9, which help to maintain healthy joints, and brain and heart functions (it has 10 times as much omega-3 as olive oil). Use this distinctive, pungent oil sparingly, as a last- minute touch for Asian dishes and salads. Supplying a good balance of polyunsaturated and monounsaturated fats, the oil is usually made from toasted seeds, which concentrates the flavour and gives it a dark amber colour. Once open, use within a month or two, as it quickly turns rancid. Which is best for frying? Each oil has its own smoke point (the temperature to which you can heat it before it smokes). The smoke point is also affected by how refined it is – refined oils have higher smoke points. 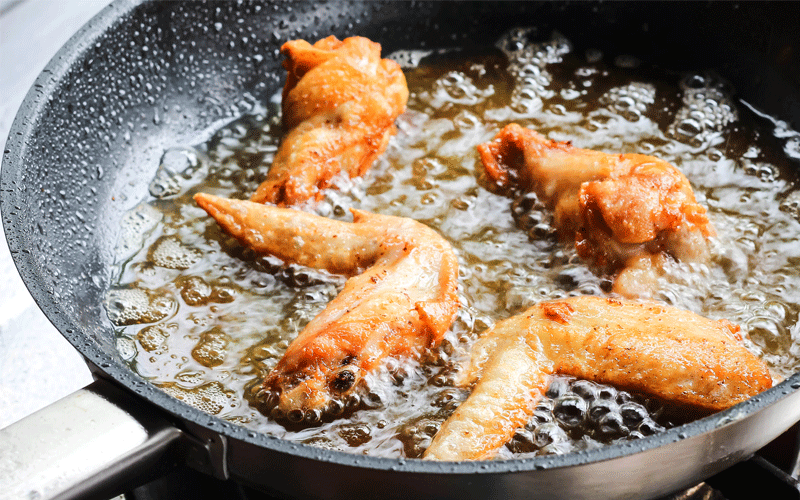 For both deep- and shallow-frying, choose an oil with a high smoke point, which enables you to cook hotter and faster, reducing loss of nutrients and potentially absorbing less oil. Groundnut oil is best (225C), followed by rapeseed (210C), corn and regular olive (200C), and sunflower (190C). Oils lose their distinctive flavour when heated, so save expensive ones for the table. How long can you keep oils? Most oils will keep for a year or longer in a cool, dark place. Once open, use within three months. There is no particular advantage to keeping them in the fridge; some will go thick and/or turn cloudy, but they will return to normal when brought back to room temperature.